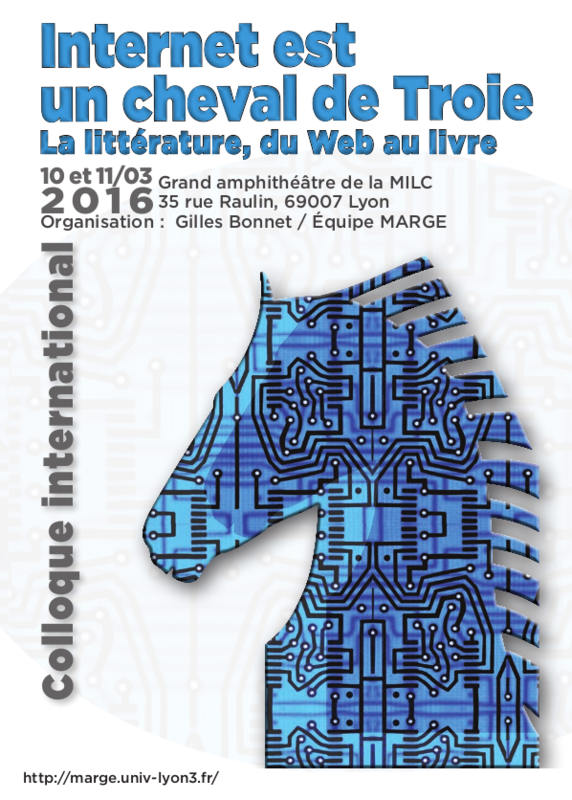 I have the great pleasure to announce that Fabula just published, yesterday evening, the conference proceedings of Internet est un cheval de Troie, which you agreed to participe. The conference happened in Lyon, in March 2016. Élisabeth Routhier and Jean-François Thériault, doctoral candidates at University of Montreal, talks about the Auctorial Performance and the Literary System around Pourquoi Bologne from Alain Farah. Marcello Vitali-Rosati, holder of the Chair and associate professor at University of Montreal, concludes the publication by article Paper Literature and Digital Literature, An Opposition ? To access the whole publication, it's here. This conference was supported by the Research Commission and the Letters and Civilisations' Faculty of University of Jean Moulin-Lyon 3.